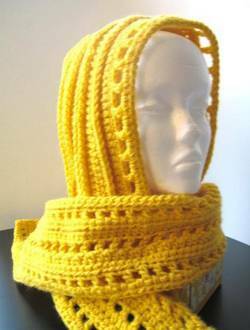 As the designer of this attractive hooded scarf points out, the scarf is often one of the first patterns that a beginner in crochet will try. It offers a chance to become familiar with common stitches while making a warm and pretty accessory to wear. This pattern is made from worsted weight yarn and it works up quickly in double crochet stitches. The ridges on the hood add texture, but are optional; if preferred, you can omit that step.The pattern illustrated here is made with a simple edging around the hood, but if you are familiar with shell or picot stitches, you could try these edgings instead. As for colors – well, as you can see, this hooded scarf looks great in a single color, but the pattern also lends itself to a striped design, as the ridges can easily be worked in a contrasting color. You can view the Free Crochet Pattern – Aesthetic Hooded Scarf online, or download it as a free PDF file. The pattern includes detailed instructions of stitches, as well as close-up photos to follow.